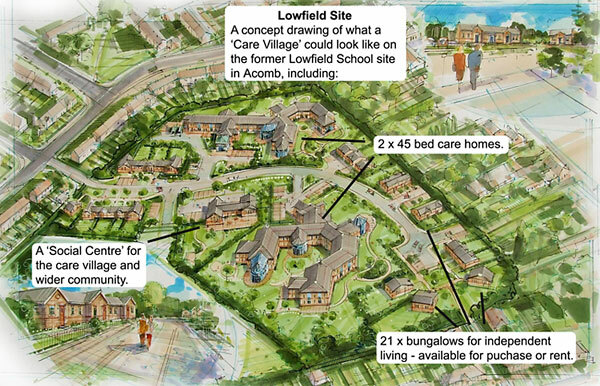 As the months stretch into years, the responsible Cabinet member (Cunningham- Cross) was asked at the last Council meeting when she now thought that the care village – which was agreed in 2010 as the preferred use for the Lowfields School site – would actually be occupied. The answer was evasive and failed to acknowledge that the failed project was one of the reasons why social care costs in the City are soaring out of control. “This is an extremely complex and ambitious project and the competitive dialogue phase has not yet concluded. As it is still ongoing it is not possible to answer the other questions raised”. The truth of the matter is that in 2011 and 2012 the project became mired in internal Labour party wrangling involving the local government unions which had funded its 2011 election campaign (and who wanted the council to run any new facilities). The Council realised over 2 years ago that an independent operator was needed but were then unable to make the investment and running costs stack up. The project has been in limbo ever since. We suspect that nothing will happen now until after the local elections in May, after which we would expect the project to be revived but with the private sector taking a major role. It’s another example of inexperience and over ambition leading to the wrong answer for taxpayers. It can be added to the Community Stadium project and the reuse of the Guildhall as examples of an administration making, what should be, straight forward decisions unnecessarily complex. This is indeed an odd answer regarding the Lowfields site. Earlier this year, at a meeting with the then Leader, Stewart Halliday responded to a question regarding this and indicated that in Fact they had not gone out to tender because they were still not certain what form the scheme would take. He also indicated that he had the responsibility for this project and was still looking at schemes in other countries!